Preparing for a successful repository research trip involves numerous actions. Most of these actions occur before the trip, but some cannot be facilitated until arriving onsite. Still other steps are necessary after returning from the trip to complete the cycle and begin preparation for the next research trip. Crafting a solid research strategy will ensure success before, during and after the trip. 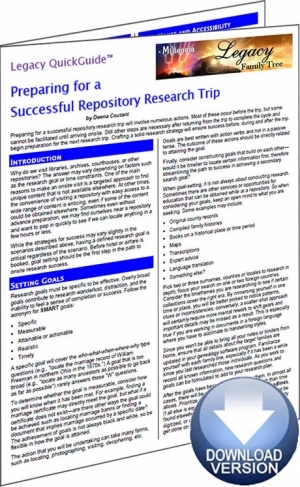 The Preparing for a Successful Repository Research Trip Legacy QuickGuide™ contains useful information including how to set research goals and develop a research plan, strategies for duplicating and organizing information, and more. Detailed checklists are provided for trip logistics, repository rules and resources, staff accessibility and supplies to pack. Also included are links to websites and resources covering top genealogical repositories to visit. This 10-page PDF guide can be used on your computer or mobile device for anytime access.